Yes, no helmet and no shoes. I survived childhood without them, and I’m sure my kids will, too. Peter is riding a balance bike. It has two wheels but no pedals. He loves it. Loves loves loves it. 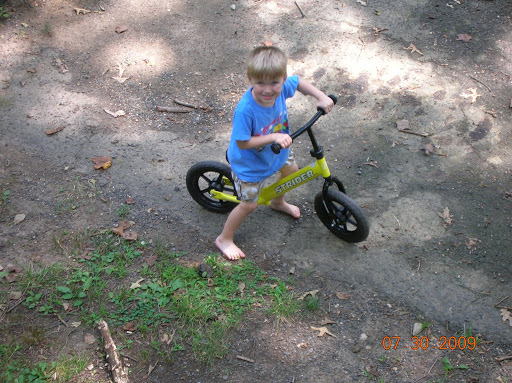 We bought him a balance bike two Christmases ago. He was 2 1/2. It was an inexpensive wooden model, and it was just a tad too big for him. But that’s OK. Kansas is pretty cold in the winter time. By spring, he was big enough and had already gotten the hang of it by riding in the basement. He loved that bike. But it was an inexpensive wooden model, and it kept falling apart. We kept putting it back together, but when the falling apart started happening more often than the staying together, and when the falling apart started causing injuries (especially since he wears no shoes or helmet), we decided it was time to get him another one. Supposedly, little European children use balance bikes instead of tricycles and then when they are four, they go straight to two-wheels with no training wheels. Peter is four, but I knew there would be a learning curve with a two-wheeler, plus we have a bike all ready for him when he’s five. So I opted to stick with what he loves, just better. This time I went with a Strider bike which is metal and has an easily adjustable seat and handle bars. On the lowest setting, Mary (22 months and small) could have fit on it. Peter’s setting is about halfway up, so he has room to grow. This kid is so happy. For several days after he got the bike, he was glowing. He would sigh happy sighs and give me hugs and kisses all.day.long. He said thank you and I love you a bazillion times. He just loves this bike. I had never heard of a balance bike before, so I had to look it up. Very cool! I think we'll consider one for our youngest. It seems very much up his alley. We've read that this is the best way to learn to ride for young children. DH took my daughter's pedals off the bike to try and coax her into not being afraid. However, the cranks are still there to get in the way so she hasn't taken to the idea. My youngest would probably like it much better. The way to a man's/boy's heart is not through the stomach…it's through mechanical toys. It's like when we get our first brand-new car and tell the wife how much we love her for letting us get it. never heard of this before, doe they just push themselves along?? How cute! Good for Peter! When I lived in Copenhagen, the local park had so many different varieties of bikes to get the kids trained early on how to ride a bike. It is a very bike friendly city and there is a park specially made to teach the rules of the road to the kids. (Driver's ed for the bikers of elementary school age.) They expect 5 year olds to be able to ride alone to school. They also expect 7 year olds to ride the subways unaccompanied too. Different expectations in a different culture.